The team here at Access are proud to announce that we competed in the Steptember challenge this year. 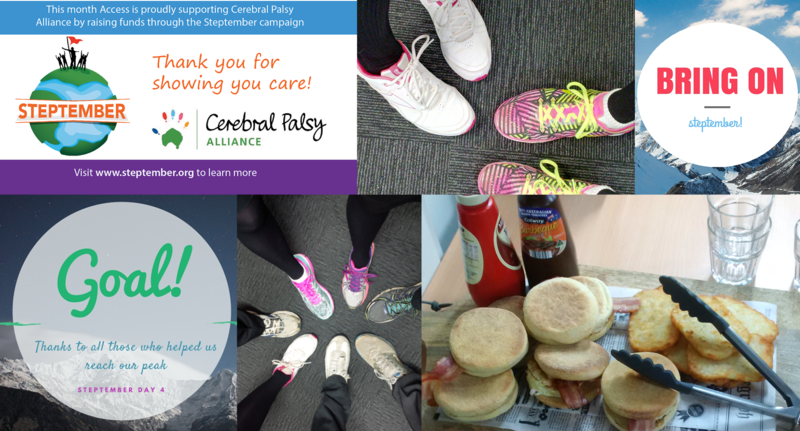 Each team member was required to aim to complete 10,000 steps per day from 2nd to 29th September in order to raise awareness as well as much needed funds for those living with Cerebral Palsy. During the month we held several small events to raise additional funds for the Steptember campaign, including a staff breakfast. Between our two Steptember teams, we raised a sensational $2711.16! As a nation, the 2015 Australian Steptember family have raised over $3.7 million. These funds will help fund essential equipment, services and provide physiotherapy and development opportunities. We sincerely thank all those individuals and companies who donated to this worthy cause and helped us reach our fundraising goals.